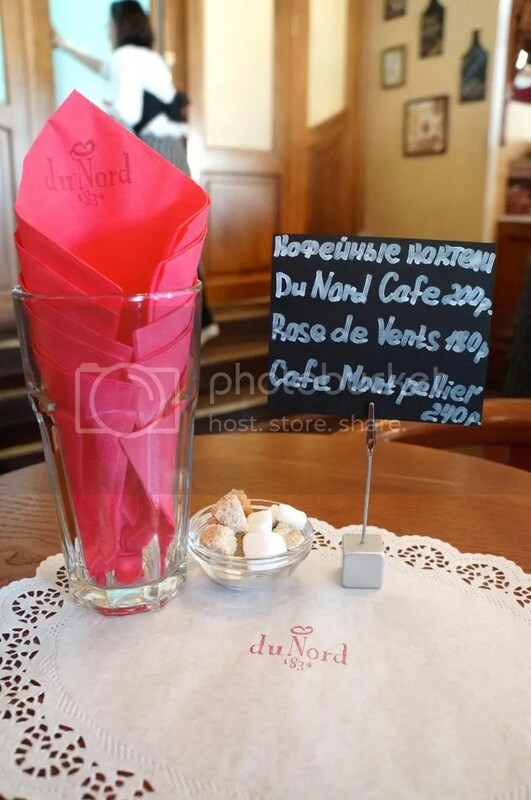 Just a short 5-min walk from Crowne Plaza Hotel, where I was staying in at St. Petersburg, is a really quaint Parisian-feel cafe called Du Nord that opens round the clock! I love how plastic baguettes lined the window displays, as well as the vintage luggage window-sticker, which was rather apt as Du Nord was located opposite the Moskovsky train station. 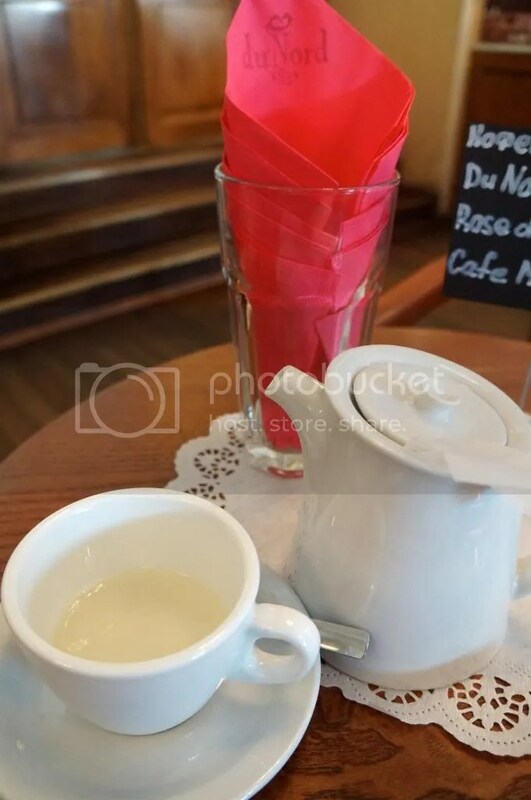 The cafe had exuded good vibes even before stepping in. p.s. : prices are based on estimated exchange rate of S$1 = 25 Roubles. Short stairway up to the spacious and elaborate cafe. 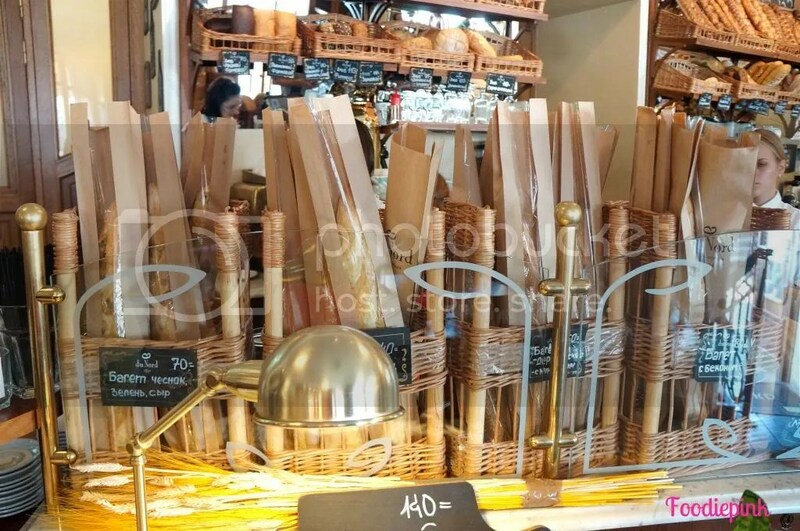 Fresh baguettes for sale, anyone? 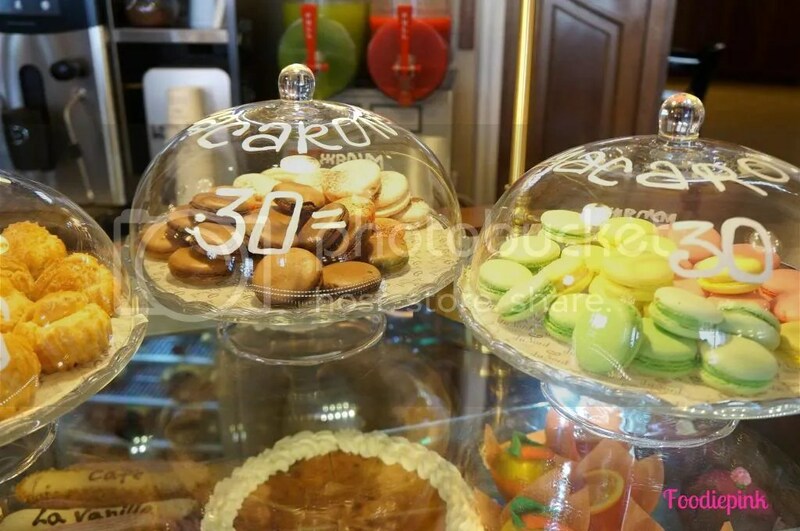 Mind-boggling array of sweet treats – had to ask for recommendations! 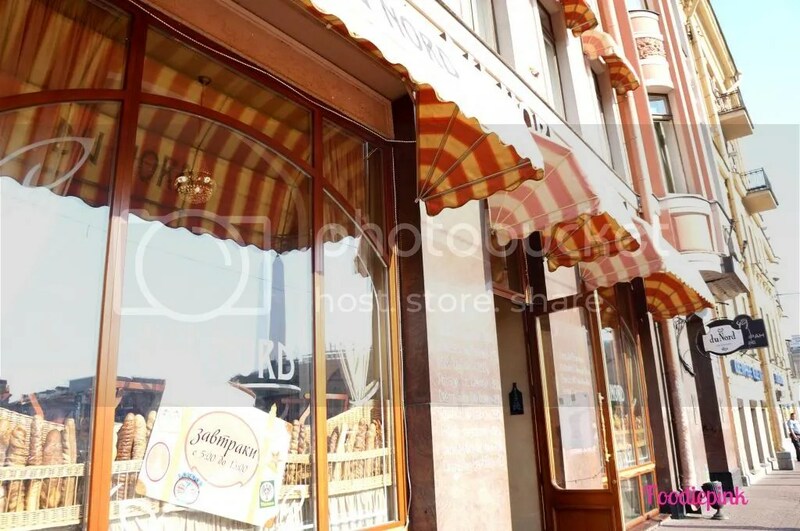 LEFT: Doilies with cute pink stampings of the cafe name were used as place mates for every diner. 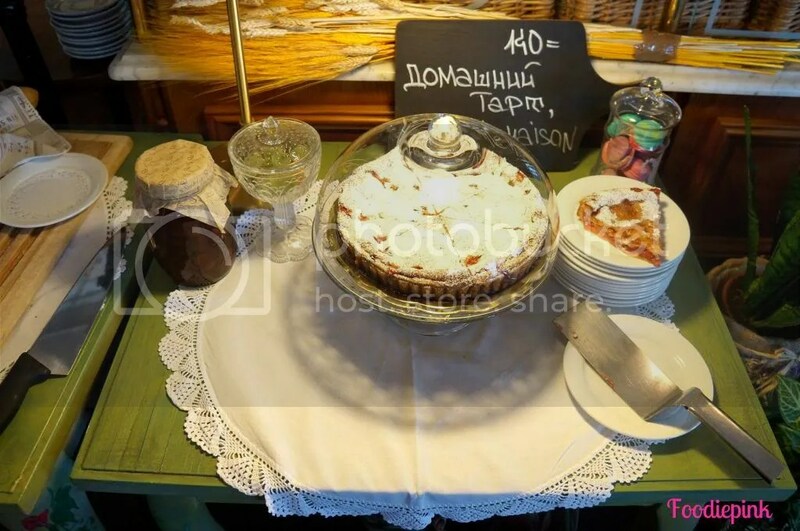 RIGHT: More pastries with neat, hand-written item names to add a personal touch! 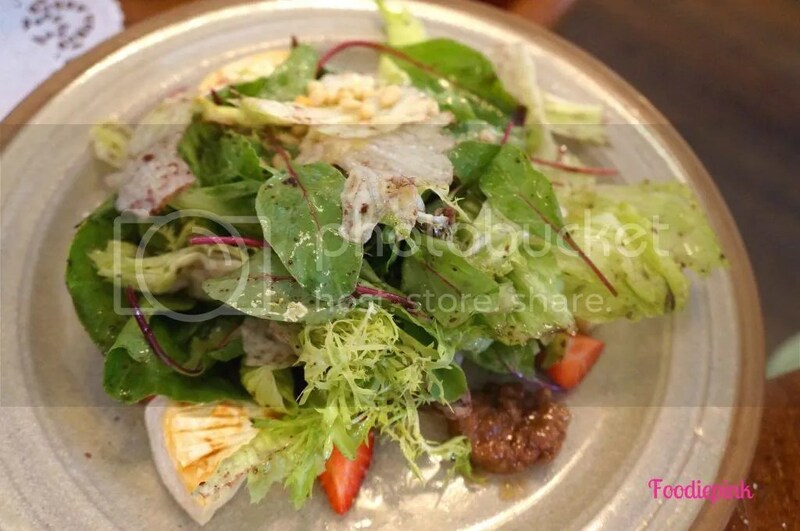 Salad of Fresh Strawberries, Grilled Brie & Duck Liver (270rb/$10.80) – When I ordered this, I assumed that “duck liver” was “goose liver”. It was a major mistake that I realised the moment it was sent to my mouth. 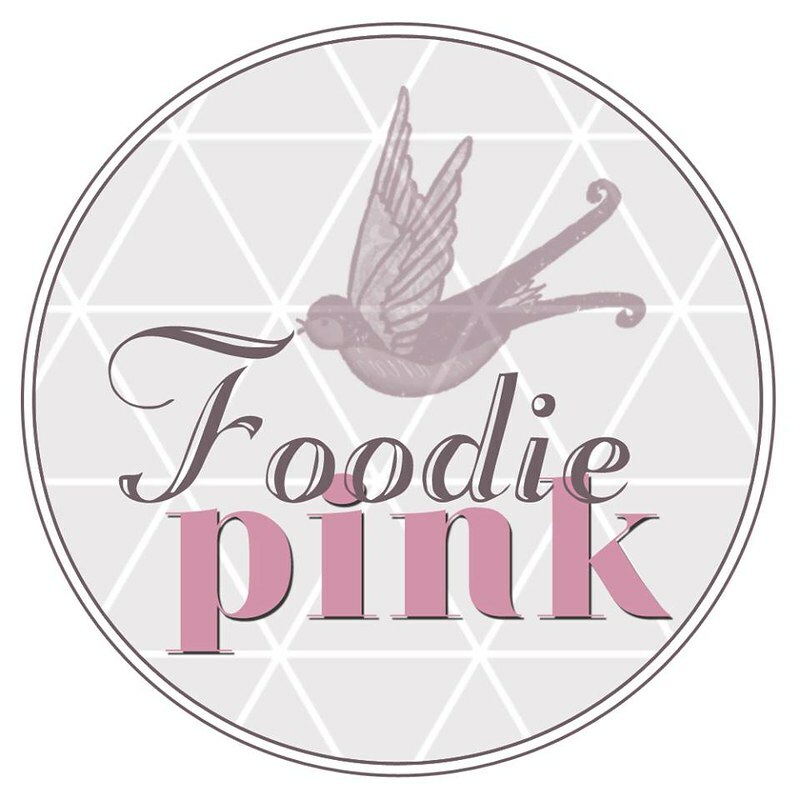 I am one who don’t take any forms of innards, with the exception of foie gras of course, so the taste of duck liver to me was really pungent and nauseating. Apart from the slight incident, I thought that the marriage of strawberries and salad leaves was perfect and the brie cheese was grilled till gooey. Moules-Frites [Blue mussels poached in white wine w leeks, butter, thyme & black pepper. Served w potato croquettes and ‘aoili’ sauce] (490rb/$19.60) – This was a fabulous and wholesome dish. The mussels were fresh, though taste-wise, I found no difference between black and blue mussels. Since a whole garlic was used, there was no fishy taste at all but simply, the fragrance of the white wine and herbs. The soup was clear and light, full of seafood goodness. 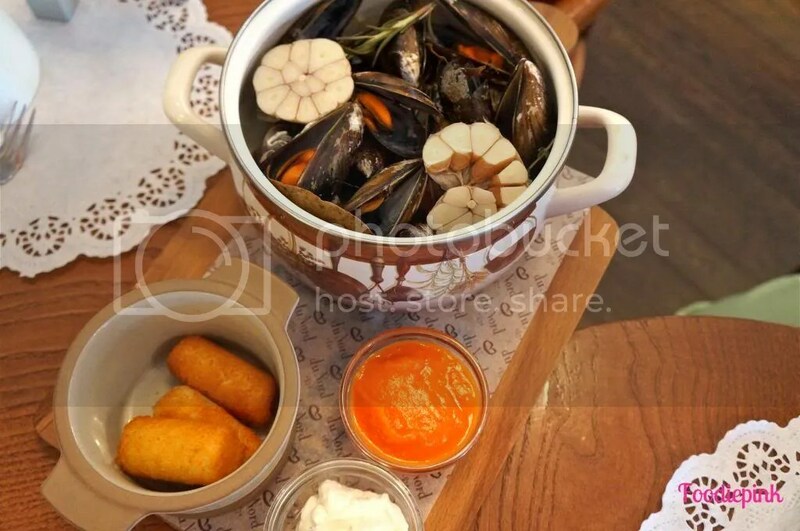 Even though the mussels were the star of the dish, the croquettes were that close to stealing the limelight. The crispy casing was thin and warm, with its potato core extremely smooth and fine. I loved the aoili sauce as well, which was tomato-based with a hint of spice! A memorable dish indeed. 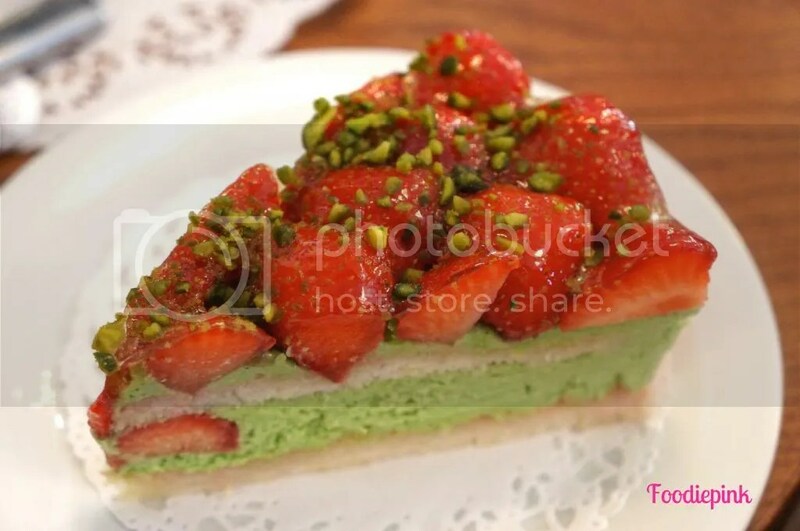 Strawberry Pistachio Cake – One thing about the strawberries desserts here is how sweet and juicy the berries are and that’s half the game won already. This cake was delicious with thin sponge-cake layers between the pistachio mousse. Thankfully the other elements were not too sweet, which would then overpower the strawberries. I really liked how every mouthful was an explosion of plump berries and its juice. 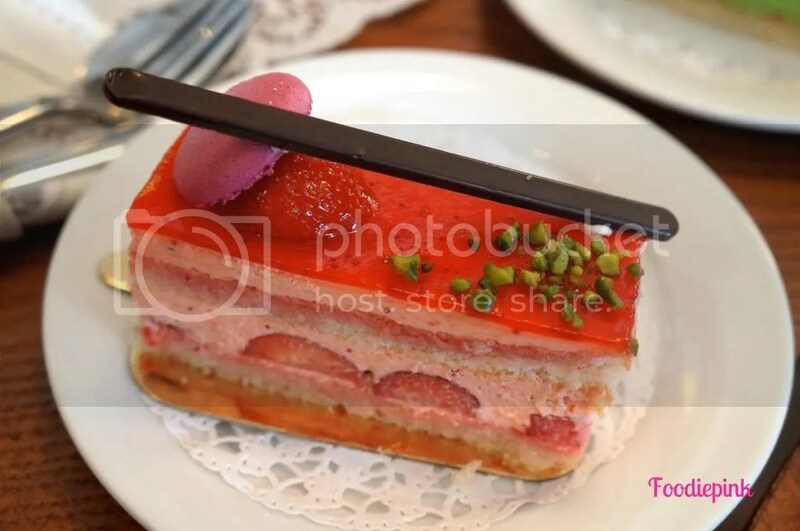 Strawberry Mousse Cake (220rb/$8.80) – This was as delicious but I prefer desserts with more fresh fruits. One thing that makes this a winner is how the mousse was light and there was no artificial taste at all. 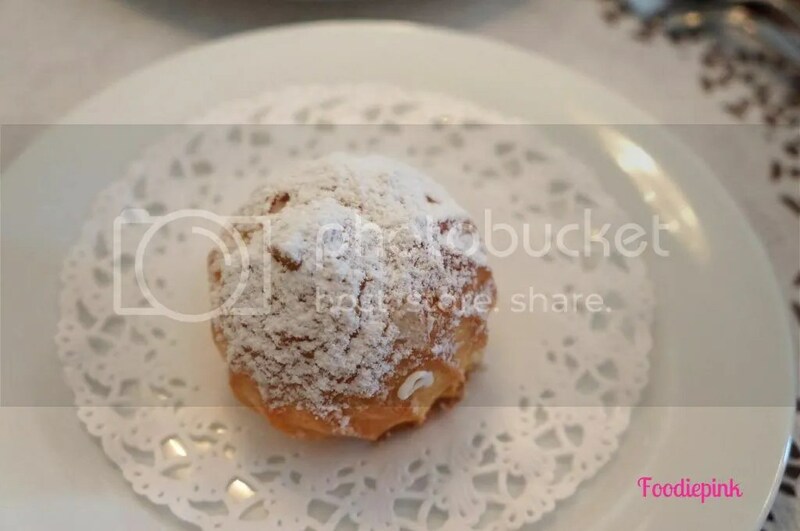 Cream Puff (100rb/$4) – Nothing to shout about but I do appreciate the doily paper placed underneath! 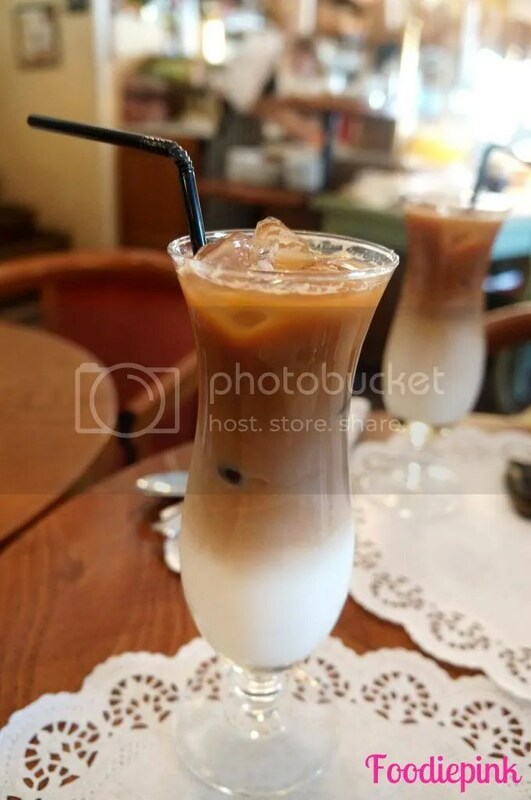 RIGHT: Frappucino (180rb/$7.20) – It was a really warm afternoon and this chilled milk coffee felt like heaven. I think this proportion of milk and coffee was perfect – unlike in Singapore, where we usually have more coffee than milk. We came back here again for breakfast on Day 3! 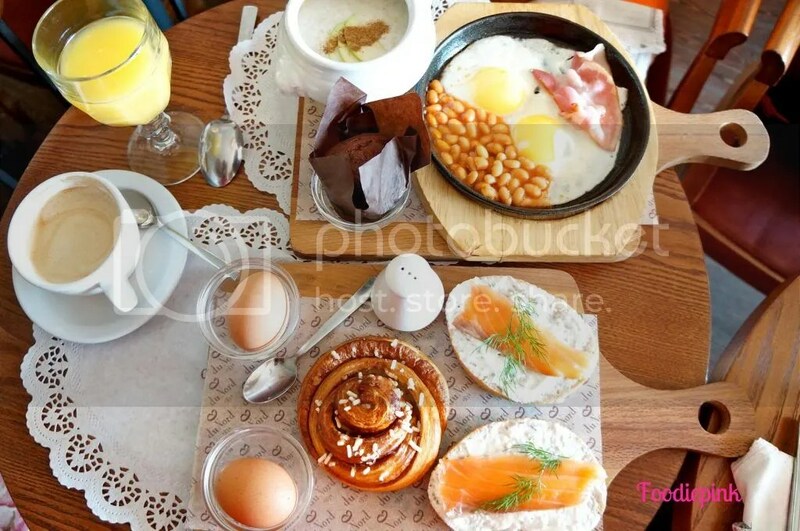 They had a number of breakfast sets named after different cities. Each set comes with orange juice and coffee or tea. 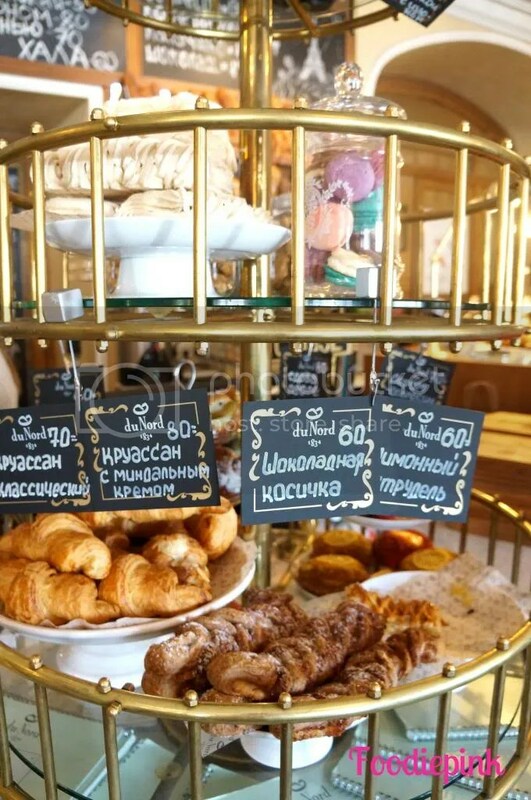 Du Nord Cafe is one of the few amazing cafes I have found in St. Petersburg – the city is practically littered with such charming and whimsical cafes! 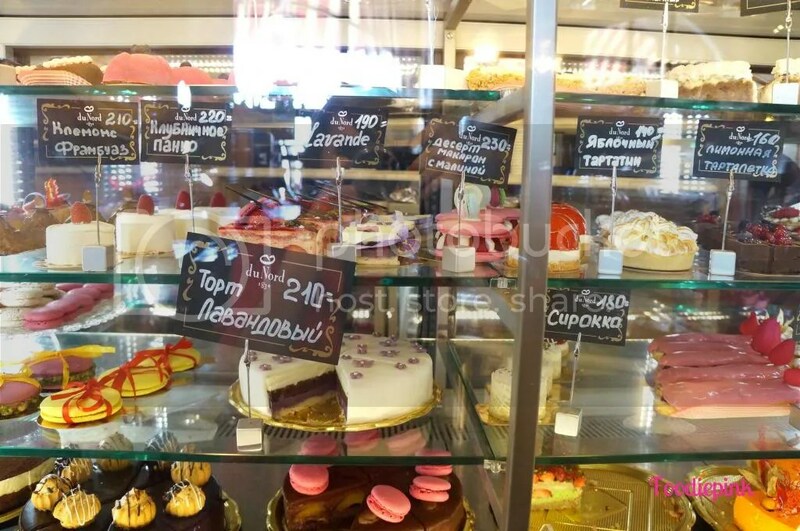 Before I traveled to Russia, I had no idea how strong their cafe culture was but it was a pleasant surprise nonetheless.